Operating Big Data applications successfully at scale is key consideration for our enterprise customers. Typical Big Data applications span across multiple different technologies, as well as operating environments. Monitoring this complex infrastructure in an efficient way is the key challenge for our customers. Today, we announce the preview of HDInsight cluster monitoring in Azure Log Analytics, ushering a new era of enterprise grade Hadoop monitoring for mission critical analytics workloads. HDInsight customers can now monitor and debug their Hadoop, Spark, HBase, Kafka, Interactive Query, and Storm clusters in Azure Log Analytics. Monitor all of the HDInsight clusters and other Azure resources with a single pane of glass. Extendable workload specific dashboards along with sophisticated analytical query language for deep analytics. 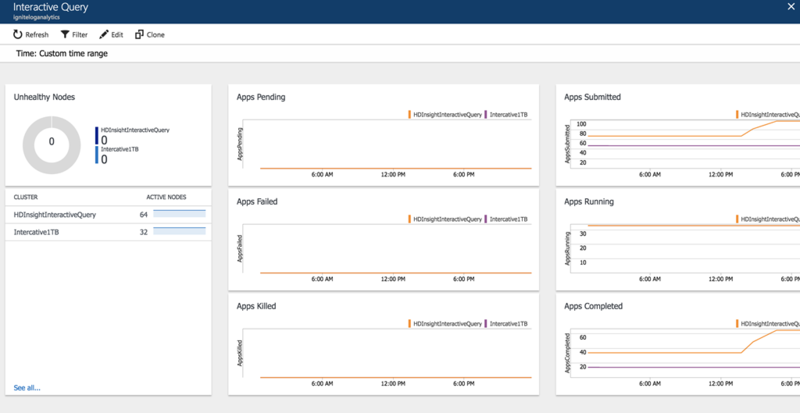 Alerts on critical issues with built-in Log Analytics alerting infrastructure. Troubleshoot issues faster by having Hadoop, Yarn, Spark, Kafka, HBase, Hive, Storm logs, and Metrics in one place. Here is a quick video on how to use HDInsight in Azure Log Analytics. HDInsight integration with Azure Log Analytics help you to gain greater visibility into your Big Data environment. Learn more about the capabilities and to simplify monitoring of your Big Data applications.